STICK YOUR MONSTER TV ON THIS FULLY ASSEMBLED STYLISH UNIT. I wouldn't normally think of something like this as a hotdeal, but when I looked around for a similar quality product it actually seems like a really good deal. Ideal for TVs up around 60 inch though you may get a small over hang each side with a monster that big. I have this...... bought it from Buyology for about £120 iirc. Its not thick solid oak and has thin panels with thicker edges to give the illusion its more substantial than it really is. Saying that though, it seems quite strong and holds my 50" Panny on top, PVR, Bluray, micro hi-fi on center shelves and speakers fit well in the shelf behind the doors on each end. Been pretty happy with it. Whats the point in linking a deal more expensive than OP's deal ? Delivery charge makes it more expensive...... and its NOT self assembly. 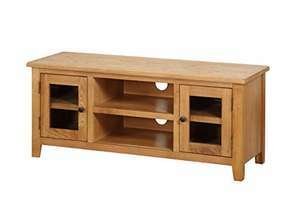 I have this...... bought it from Buyology for about £120 iirc.Its not …I have this...... bought it from Buyology for about £120 iirc.Its not thick solid oak and has thin panels with thicker edges to give the illusion its more substantial than it really is. Saying that though, it seems quite strong and holds my 50" Panny on top, PVR, Bluray, micro hi-fi on center shelves and speakers fit well in the shelf behind the doors on each end.Been pretty happy with it. Do the 2 doors have glass panels? Difficult to see in the picture.